These tips are now part of a two-part online writing course! Also see 2PPOV, Exercises, Ideas, Pitching to an Agent, Sentence starts, Writing a synopsis, Writing scripts and Writing-related books. I’m also a freelance editor so also share over 70 editing tips on this sub-page. I talk about various subjects on Me Guest Blogging On Your Site. Rosalind Minett also has writing tips on her blog. There is also some of my advice on my Ask Me page – scroll down to the comments section. At 5am on Wednesday 24th October 2012, I woke up to a message from my Facebook friend Scott Goodman saying, “Hello again Morgen. Been listening to some of your podcasts on tips for new writers, really interesting about the common mistakes that are made. Just to throw an idea at you have you thought about a section on your blog for, so to speak “writing 101″, how to teach the complete idiot to put pen to paper (yes me lol)”. I’ve met Scott (at the booQfest 2012) and know he is far from an “idiot”. I replied what a good idea it was and that “idiots” were only beginners who hadn’t learned yet… so, hence this page. Thank you, Scott! I’ll build it up with lots of hints and tips but if there’s anything in particular you’d like to know then leave a comment at the bottom (and I have an Ask Me facility). There’s also a (Roald Dahl) shed load of hints and tips on the Podcast – mixed episodes page. I disagree. I started writing for fun in 2005 and have written eleven novels (at various stages including seven NaNoWriMo novels) and various short story collections (including Story A Day May, and ‘Fifty 5pm Fictions’ Collections) so I’ve reached that target but I’ve thrown very little away. If like me, you’ve dabbled before knuckling down, you’ll feel better for it. It’s all about practice. If someone sat you in front of a piano, would they expect you to play a concerto? Would you expect that of yourself? Beginnings – where better to start than at the beginning? Beginnings should invariably start with the action. Avoid information dumps where you giving so much to the reader that their brain hurts especially where it’s irrelevant – do they need to know where the main character (protagonist) went to school? Sure, if it’s relevant and if they’re still there, or they’re reflecting back on it for a reason. That said, when you’re writing a first draft it doesn’t matter how you start. It’s often said that an author can either delete (or better still cut / paste into another document) the first two chapters because the action starts in the third. If the first two chapters are important they can be slotted in later. Sure, we need to know who our protagonist is, the dilemma they’re facing, an indication of setting and another character fairly soon as they’re bound to have an interaction with someone else at some stage and it’s often another character (the antagonist) that causes our protagonist the problem”. Bit by bit – I love the statistic that 300 words equates to over 100,000 words a year – a healthy novel word count – so a great incentive. I post two sets of writing exercises on my blog every weekday, each one set for 15 minutes. You could write your 300 words in that time! Chapters: endings – just like a TV drama where the end of a section (giving you time to go off and make a cup of tea), it should be so compelling that you can’t wait to continue watching. With your novel, your reader want to start the next chapter regardless of the time (a lot of readers read at night). Your endings should either resolve your chapter but reveal a new fact that could then be expanded on in the next chapter, put your character in peril so you want to know that they’re going to be alright. I talk more about endings later. Chapters: lengths – how long should your chapters be? It doesn’t matter. James Patterson’s are anywhere between a paragraph or a few pages. Graham Hurley’s 300-page novel Nocturne has three chapters. I’d advise no more than 15-20 pages per chapter so that your reader can read the whole chapter in one sitting (e.g. before going to bed), although hopefully your novel will have such a great hook that they want to keep reading anyway. Characters: antagonist vs protagonist – the hero / heroine is the protagonist and the person (or thing) they’re up against is the antagonist because they are antagonising them (pro vs anti). Most protagonists will be likeable and antagonists unlikeable but you’ve got to feel strongly for them all so that you care what happens to the good guy / girl and that the bad guy / girl gets their comeuppance. Characters: endearing – is the main character likeable? Even if he or she isn’t, the reader has to care what happens to them. If your reader doesn’t care about your hero / heroine, they probably won’t continue to the end of the story. Characters: flaws – all characters should have flaws. No one is perfect, even the good guys (and gals). Most readers will find characters with a disability, however small (a lisp, a limp), endearing. As well as external flaws, your characters can, and should, have internal flaws, e.g. thinking they’re not as attractive as they are, thinking they’re more attractive etc. On the flipside, consider giving your antagonist (the bad guy) a redeemable quality. As the cliché goes, not everything is black and white. What may not appear as a flaw, e.g. a character being particularly tall, could hinder them, e.g. a tall woman trying to find a tall partner. What difficulties would a 2m / 6’6″ man have? Someone taller who has to dip under doorways? Characters: names – character names are important as we often get a sense of their personality by what they’re called. A Mavis is likely to be older than a Britney and would, usually, act differently. Avoid having names starting with the same letter; if you have a Todd talking to a Ted, the reader can easily get confused. Bill and Ted would be fine and as we know, they had a wonderful time back in the late 1980s. Try to avoid starting your sentences with your character’s name, as it can get repetitive and obvious. I’ve often recommended to my editing clients to write a list of their (your) characters in a five-column portrait table: 1. A-Z going down the page (at least two lines per letter); 2. Female first name (& chapter no. if you’re writing a novel); 3. Female surname / chapter no. ; 4. Male first name / chapter no. ; 5. Male surname / chapter no. As well as ensuring they don’t all start with the same letter, it encourages them (you) to try for the more unusual letters. I have a Character table for novel (and another for short stories). Let me know (morgen@morgenbailey.com) if you’d like me to email either / both to you. Also do search for your main character names online (e.g. search engines and online bookstores) because you don’t want to create a protagonist or antagonist who is already famous in another writer’s book, on TV or in real life. Characters: quantity – don’t have too many characters in your stories. Two or three is usually enough for a short story. I read Kate Atkinson’s Behind The Scenes At The Museum for a college course. The novel had about a dozen (eleven, from memory) different female characters. I ended up drawing a family tree (they were all related on the maternal side) and admit I was struggling but I persevered and was very glad I did… she became my favourite living author. Characters: viewpoint – even if you’re using omniscient third-person point of view, you must have a new section (blank line then new non-indented paragraph) if you’re changing point of view, i.e. if you’ve been in one character’s head in the earlier paragraph and now want to be in another. Click the following link to read the other 40+ tips as my two-part Writing Tips online writing course. And advice from two (other) experts: Top 10 tips for being a best-selling author by Sophie Kinsella and PD James. Interesting that they both say not to divulge the plot to anyone until it’s finished. Also Top 10 tips for writing a Hollywood blockbuster by Tony Gilroy (who wrote the scripts for The Devil’s Advocate, Armageddon and the Bourne films). EDITING – I have many (over 70) editing tips on this sub-page. Dialogue: layout – each character should have its own paragraph when speaking so if you have two or more characters speaking, when they speak the text should appear on a separate paragraph. Font – usually in Times New Roman or Arial, pitch font size 12. If you’re eBooking, either is fine for Amazon but Smashwords prefers Garamond. Italics – if you have a character thinking, you’d usually use italics. You can also use it for quoting names in your story, such as a restaurant or book title. Justification: left side – pick up a book of fiction (especially a recent one) and you’ll see that the first paragraph of any chapter is not indented but the rest are. This is fairly standard across the board and how agents / editors would want to see your manuscripts laid out. The indented space should equate to 2-3 spaces maximum. You can adjust this by moving your ‘first line indent’ tab on your ruler (if you’re using Word or equivalent, it looks like a diamond-triangle) across 2-3 spaces from the left. You would need to move this back (or press your backspace key once) when you create a blank line between paragraphs or start a new section. Justification: right side – your document doesn’t have to be right-hand justified. It’s actually best not to because if you have a line with some long words, it’ll create too many spaces between them as it stretches them across the page. Spacing: paragraph – some writers are tempted to leave a gap when they’re changing character speech or a different topic but you would just use a new line. Generally you’d only use a new paragraph (with a blank line in between) when there has been a passage of time. You must however, have a new section (blank line then new non-indented paragraph) if you’re changing point of view, i.e. if you’ve been in one character’s head in the earlier paragraph and now want to be in another. Spacing: words/sentences – another kind of spacing: spaces between words. One. Old school (when I first started my secretarial training) was for two spaces but text these days is just separated by one space, even sentences. Speech marks vs inverted commas – I’m either old school or just plain English but to me, speech marks (” “) are for speech and inverted commas (‘ ‘) for names, speech within speech marks etc. Either way, you would use one for dialogue and the other for pretty much everything else. As long as you’re consistent you can use either. Remember though that the punctuation in dialogue is different, e.g. “It wasn’t the only one,” he said, scratching his head. The comma there goes inside the speech marks whereas if you use them as a name: My latest book, ‘The Serial Dater’s Shopping List’, is a chick lit. the comma would go outside because it’s not dialogue. I often get mixed up with dialogue punctuation as it doesn’t follow ‘normal’ rules so have a look in any book and you should be able to see an example of what you’re looking for. Submitting your manuscript – if you’re submitting to a competition, you mustn’t have your name on the document. You should if you’re submitting elsewhere. These days, you’re likely to submit via email so it will remain one document but if you’re sending a printed document, I’d recommend having your name in the footer (on the left-hand side, and the page number on the right-hand side) and the title of your novel in the middle of the top header. Rules for eBooking are different (especially page numbers – you shouldn’t use them – because eReaders will have their own numbering system depending on what font the reader themselves use to view the document) and I mention them here. http://www.marlyspearson.com/formatting_101.htm is a great guide targeted at submissions for US agents / publishers although much of it is relevant for the UK. Join a writing group, get your work critiqued. Read your work out loud. It’s amazing what you’ll pick up when you hear it outside your head. I have some writing group tips on https://morgenbailey.wordpress.com/writing-groups. Subscribe to writing magazines, go to workshops, literary festivals. If you want to write, immerse yourself in all things literary. Know your audience: If, say, you’re writing for UK women’s magazines, know what level of a dilemma you can use for the likes of People’s Friend (gentle) to Woman’s Weekly or Take a Break (crime, spine chillers etc). I’ve been asked about copyright and http://mistakeswritersmake.blogspot.com/p/copyright.html explains this well. Unless the author sells it, copyright will always stay with them until 75 years after their death. This means anyone reprinting their (your) writing, has to have permission until after that date, and well-known authors will usually have estates who will have continued their copyright thereafter. If you sell something, or donate a piece of work to a charity anthology, you’re not giving away (or selling) your copyright but the rights (usually ‘first serial rights’) for them to print it but make sure you know to what extent. Usually with shorter pieces, such as fiction in magazines, you can then sell ‘second serial rights’ after a year) but check your contract. So, if you’ve been asked to give over (or sell) your copyright, I’d say don’t, unless they’re offering you lots of money or it’s something you don’t mind ‘giving’ away. If it’s for a short amount of time (though that seems strange to me), I’d say get someone in the know to read the contract to ensure that it would unequivocally be reverted to you. If your piece appears in an anthology it should appear in the credits / acknowledgements as copyright your name, e.g. (c) Joanne Smith. If you’ve been offered a novel publishing contract (or sold a certain number of books), you can apply to be a member of the Society of Authors (UK only) and although it costs £90pa to belong, it’s worth it for the free (ongoing) legal advice. Perhaps most obviously is write. Even if you haven’t got much (or anything) to say, if you start putting pen to paper or fingers to keyboard, something will come out. Even if it’s appalling (a lot of my early writing was), you can’t edit a blank page. There are many more examples I could give you (and I will put more on this page), but all you need to remember is that it’s not about clever words (because that ends up becoming ‘purple prose’) but just getting pen to paper, or fingers to keyboard and having fun. When your characters take over (and they will) you’ll have the time of your life! I also have a tip of the week (so that’s 52 tips!) 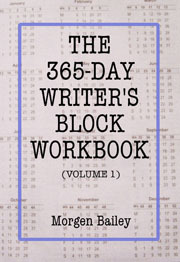 in my 365-day Writer’s Block Workbook (Volume 1), just $0.99 (or it should be, the most it would be is $1.49). Let me know if you have any specific queries. You can Ask Me or my email address is below. What are your writing essentials? Do let us know. http://www.advicetowriters.com has loads of advice and a great list of ‘Rules and Commandments’ on the left-hand vertical menu. Publisher Apostrophe Books has some great advice for authors from Hunter S Thompson, Ray Bradbury and Stephen King. https://www.sfwa.org/2009/06/turkey-city-lexicon-a-primer-for-sf-workshops was mentioned (very favourably, and you’ll see why) in one of the Writing Excuses podcasts. http://www.theshortstory.net/submission-guidelines (underneath the competition guidelines. Do you know of other tips sites? If so, do email me. You’re very welcome, David. Thanks for visiting. What’s your take on using pop slang in a novel when characters are talking like “Ok lemme know …” Or ” Sheesh! you don’t wanna do that” I think the meaning is obvious n it’s adds authenticity to the conversation but some purists may disagree I guess. Hi David. I have a bit on accents on the page and the same refers to slang. Less is definitely more. If a reader has to try to work out what the characters are saying, it’s going to pull them out of the story or at least slow them down. You don’t want anything that can distract them from the (hopefully) fast pace of your novel. I’d say OK for a minor character where they have two or three lines. The thing about dialogue is that it should tell us about the character by what they say. Slang is a good way of ‘placing’ someone. Thank you, Joy. Alright / all right, til / till and no-one / no one seem to be up to the individual – I usually go with the former in each case – but certainly anymore (time) and any more (quantity) are definitely different. You’re very welcome, Deborah. I’m glad it’s useful. If you have any queries feel free to email me (morgen@morgenbailey.com – note I’m Morgen with an e – I think morgan@morganbailey.com bounces back) or if it’s something that might be useful to others, I have an ‘Ask Me’ page (https://morgenbailey.wordpress.com/ask-me). Awesome post, Morgen. Just what I need at the moment. I am presently trying my hands on short story writing. Sometimes I get really confused as to what word to use eg before or ago. Enlish language is a second language to me, so sometimes I feel insufficient/inadequate. Thanks for the much needed clarifications. You’re so welcome, Emmanuel. Thank you for your comment. You’re so welcome, Madalyn. Thank you for leaving a comment. Hello, you’ve provided a lot of useful advice here – thank you. I would have to disagree with one thing. Under point 39 you say that readers will be more interested in the story than how it’s written. While this might be true for some readers, it’s most certainly not true for all. As writers (and as readers) words are everything to us. Personally, I’d far rather read a dull story beautifully rendered by a great writer, than a great story butchered by an incompetent writer. I find it really frustrating that so many publishers seem to see writing as medium for putting across ‘stories’ with ‘action’ in them as quickly and efficiently as possible, with little regard for the beauty of language or the importance of ideas (by which I mean philosophical ideas, rather than an action plot). You’re right, literary lad. I do mean some but most will prefer a gripping story with weak writing, and some writers say that JK Rowling and Dan Brown aren’t good writers but tell a good story. And yes, publishers want the story over writing because writing can be edited by experts. I am a dialogue fan and my heart sinks when I turn the page to packed description whereas one of my poets loves it. We’re all different and why there are so many different types of books. Thanks again for leaving your comment. So if, as a competition judge, you received a story with no dialogue (because it followed a single, solitary character) would you most likely rule it out? Absolutely not. I judge everything on its merit, the quality of the story and the writing. I start at 10 points then knock off points (or half-points) for careless errors (see my comments on https://morgenbailey.wordpress.com/2015/10/09/results-of-morgens-first-100-word-competition-september-2015 and I review a book a week – on a Wednesday so the latest went up yesterday – which includes tips for writers) etc. Dialogue over description is just a preference when I am reading. As a judge, I am impartial and it’s all about the story. OK, that clears that one up quite conclusively – thank you!